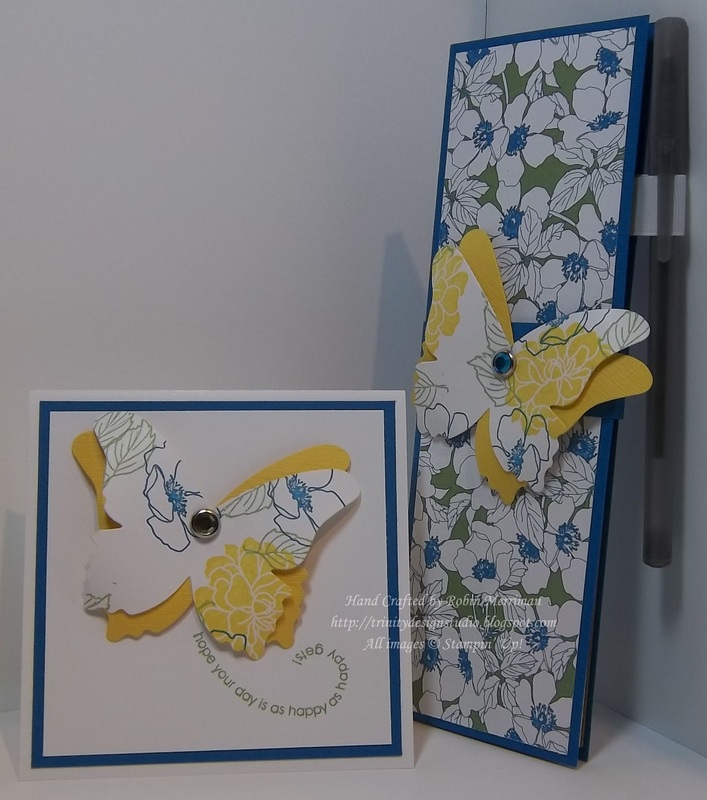 Trinity Designs: Almost Time for Butterflies! "Rain, rain go away. Come again another day!" Have I ever told you that i do not like rainy days?? I can appreciate them because I know we NEED the rain, and I'm grateful for it, but I'd be such a happy girl if it could just rain at night while we're sleeping and be nice and bright and sunny in the morning. Now that would be bliss! This weekend was so beautiful here in Virginia - we had perfect temperatures and sunny skies and soft breezes. It was wonderful to sit out on our deck and enjoy a few meals and our morning coffee. That's one of my favorite things - to sit outside and just be. Enjoying the crisp morning air, sipping my coffee, listening to the birds and watching them fly across our yard. We'll have butterflies soon and I'm looking forward to that too. Even though our butterfly population isn't out in force yet, I was certainly thinking of them when I created these projects. I was inspired by the retiring Designer Series Paper Beyond the Garden. It has such beautiful and bold colors and patterns, you can't help but think of Summer when you use it. I combined it with the Beautiful Butterflies Die for my Big Shot, the retiring Flight of the Butterfly stamp set and the retiring Rhinestone Circle Ice Brads to make these pieces. The color combo is Whisper White, Daffodil Delight and Pacific Point. I used the Fabulous Florets stamp set to stamp the cardstock for the white butterflies then cut them out with the Big Shot. The notepad has a belly band around it to keep it closed and I added a Whisper White 5/8" Grosgrain Ribbon loop for the pen. If you're wondering about the notepad itself, I took a pile of small size legal pads to my local print store and had the cut in half with their saw. The cost was minimal and the size was perfect for these pocket pads. We're going to be making these projects at my next Chick-Fil-A event - Crafty Chicks n' Chickn' on Monday, June 18th. The event is posted on my demonstrator website and on my Trinity Design Studio Facebook page, so you can RSVP easily! You should come out an join us, I think you'll really enjoy making them. For now, if you just can't wait - you can visit my Online Stampin' Store and purchase the supplies while you still can. All the retiring products I used are going away on May 31st, so don't miss out! I hope your day is sunny and warm wherever you are, I'm going to be making my own sunshine in the studio today, can't wait! love your layered butterflies and that paper is soooo pretty!